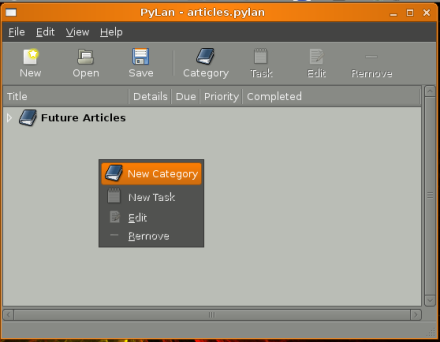 PyLan a GTD todo application written in python and PyGTK – part four context menus! Hello welcome to the fourth installment of the PyLan tutorial. This will be a quick tutorial to introduce one feature: context (or popup) menus. I’ve had many questions regarding this so I thought I would take a quick stab at it. If you want to follow along with the code in detail, and have not done so already, you should read part one, part two and part three of this series. You can download the full source to this tutorial here. 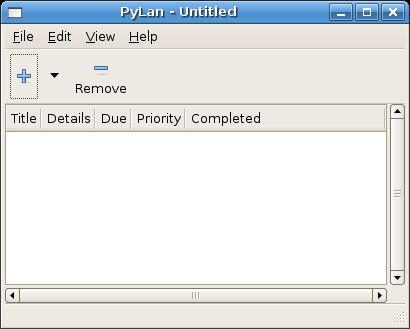 Continue reading PyLan a GTD todo application written in python and PyGTK – part four context menus! Hello welcome to the long-time-coming third article in this tutorial. I apologize to everyone (anyone?) that was waiting for it. I have been very busy as of late and have had much of my time taken up by a few other python projects, that I hope to be able to show you all soon. If you want to follow along with the code in detail, and have not done so already, you should read part one and part two of this series. How to construct a simple theme engine, or at least how I would, hopefully it will give you some ideas! How to catch the selection event in a gtk.TreeView. How to enable or disable widgets. How to remove the selection from a gtk.TreeView if the user clicks on the gtk.TreeView but not on a tree item. This is part two of the PyLan tutorial series, if you want to follow along with the code in detail, and have not done so already, you should read part one of this series. Working with the DateTime python module. All right, many of you have probably heard of, or read, David Allen’s book Getting Things Done if not it’s a pretty interesting book about how to organize the things in your life. As I was reading it I thought that a simple todo list could be created using Python and PyGTK pretty easily, so I decided to create the application and write a tutorial surrounding it. Since the actual application is quite large I have decided to break it up into a series of tutorials, each highlighting a few specific tasks. The full goal of this series is to show everything that is required when creating a python/PyGTK based application, for the GUI setup all the way to distribution. So the application that we will be creating will be called PyLan, pronounced: plan. In brief it will be used to create a tree of tasks that can be organized into categories and subcategories. Saving and loading the data from the tree using cPickle.